Shipping: Ships next business via UPS Ground or USPS only. We want you to be completely satisfied with every item you purchase from us. Please note that DVDs, CDs and books are returnable only if defective or damaged during shipment. Please visit our Product-Specific Returns Policy page for more information. Please note that this item ships separately, and ships via UPS Ground or USPS only. For more information on our shipping policy, or shipping this item internationally, please see our International Orders Policy for more details. 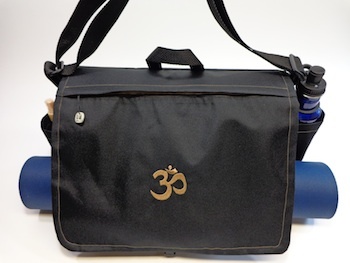 I searched everywhere for a duffle that would hold my yoga mat and not be too cumbersome for international travel on airplanes, and that would hold everything I need for a day of yoga teacher training, and this bag really fits the bill! It is super lightweight, but also very durable, and expands to hold everything you need in an organized way - snacks, water, wallet and keys, change of clothes, sweater, training manuals, etc. I highly recommend this bag!